With Thanksgiving and the holiday season rapidly approaching, I have assembled several of my favourite recipes to put you in the spirit for special family dining as well as entertaining. Now, from our table to yours, bon appétit. 1. Cut waffles horizontally in half to create 2 thin slices, keeping the halves together in matching pairs. 2. Open each pair so that the cut sides are up. Drizzle a touch of Zesty Ginger Mayonnaise (½ tsp or 3 mL) over central area of just one slice (of each pair) and add a dollop (1½ tsp or 8 mL) of sour cream. Then top with 1 oz (30 g) of smoked salmon and another dollop of sour cream before closing the waffle sandwich with the other slice of waffle (cut side down). 3. 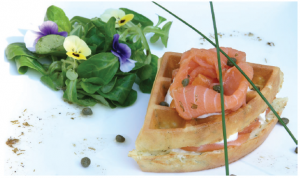 Crown the waffle sandwiches with another dollop of sour cream and finally a rosette of the remaining smoked salmon. 4. For each individual serving, secure one waffle “sandwich” in position on an individual dinner plate with a touch of Zesty Ginger Mayonnaise and sour cream (to act as “glue”). Add ½ cup (125 mL) of salad leaves to each plate. 5. Drizzle salmon rosettes, salad and plates lightly with mustard herb vinaigrette. Garnish with capers and fresh herbs. Serve promptly. * To make ¼ cup (60 mL) Zesty Ginger Mayonnaise, whisk together ¼ cup (60 mL) of mayonnaise, 1 tsp (5 mL) of peeled and grated fresh gingerroot and ¼ tsp (1 mL) of granulated sugar. Salads that can be prepared all year round and still evoke a “wow” reception are among my favourites. In this unique recipe, basically any type or combination of mushrooms may be used. Sliced, torn or left whole, the mushrooms are sautéed in garlic butter before being arranged on top of a pile of fresh, tender salad leaves. Drizzled with Sesame Balsamic Vinegar Sauce, then sprinkled with roasted pine nuts and, if desired, hearty chunks of Stilton cheese, the result is culinary heaven. 1. To make the Sesame Balsamic Vinegar Sauce, whisk together Balsamic Vinegar Syrup and sesame oil. Set aside. 2. As desired, slice, tear (e.g., for oyster mushrooms) or leave the mushrooms whole. Melt garlic butter in a couple of large skillets over medium-high heat. Promptly add mushrooms and season with salt and crushed black peppercorns. Stirring frequently, sautée mushrooms until lightly browned. (5 mL) of roasted pine nuts. 4. 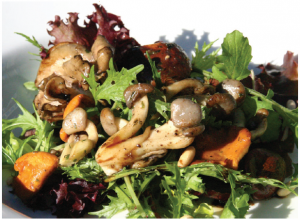 Carefully arrange ¼ of the sautéed mushrooms on top of each serving of dressed salad leaves. 5. Garnish salads according to taste, with drizzles of Sesame Balsamic Vinegar Sauce and remaining roasted pine nuts. * It is best to use a variety of different types and shapes of mushrooms (e.g., shiitake, oyster, cremini, chanterelle, maitake, etc.). Note: If strictly using cremini, portobello or readily available white mushrooms, increase the quantity to 10 oz or 280 g.
** To make 3 tbsp (45 mL) of Balsamic Vinegar Syrup, place ¼ cup (60 mL) of balsamic vinegar and 2 tbsp (30 mL) of granulated sugar in a small non-stick skillet over medium heat. Stir until sugar dissolves and mixture boils. Reduce heat to medium-low and allow mixture to simmer, stirring frequently, until reduced to 3 tbsp (45 mL). Remove from heat immediately, cover, cool and refrigerate until ready to use. *** For a milder sauce, add more sesame oil, as much as desired, to achieve an appropriate balance. If, on occasion, a menu demands something spectacular in taste and presentation, here is a winner. 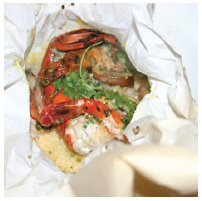 This is my version of fish/seafood en papillote. The recipe may appear complicated, but it is not. Just follow the steps. For larger numbers, create the papillotes in an assembly-line process. Cooking time is predictable; presentation is quick. 1. In a small saucepan over medium heat, reduce wine to ¼ cup (60 mL). Whisk in coconut milk, bring mixture to a boil and remove from heat. 2. Cut mushroom caps vertically into ¼-inch (0.6 cm) slices. 3. Using scissors, cut away the shell from the underside of the lobster tails. Slip your thumb in between the flesh and the upper shell, leaving the loosened meat in the shell and attached at the extreme end of the tail. 4. To facilitate the filling of the papillote, push the centre of each piece of parchment paper into separate deep narrow bowls, thus taking on a bowl-shape. 5. To each “parchment bowl,” add 1 lobster tail and 3 shrimp; drizzle with half the oil and season with salt and crushed black peppercorns. Sprinkle with half the mushrooms, chives, lemongrass, garlic, tarragon, curry, ginger, coriander, nutmeg and red pepper flakes. Drizzle with half of the wine mixture before topping with 3 sprigs of cilantro. 6. Bring sides of parchment paper together enclosing the ingredients within the “parcel.” Tie tightly with string. Place the parcels on a baking sheet. 7. With the oven rack set at the lowest level, bake parcels in a preheated 450F (230C) oven for about 10 minutes before checking to see if cooking is complete. To do this, remove the parcels from oven and untie one. The thick end of the lobster tail should have just turned opaque and shrimp pink and rather firm; if they’re not, retie parcel and return to oven until done. 8. To serve, set each papillote/parcel in a wide shallow soup dish or bistro bowl. If desired, snip string and open. 9. With each papillote, present a separate side plate with a variety of accompaniments (e.g., farfalle pasta, small florets of broccoli and pieces of coloured cauliflower) designed to be gradually added to the papillotes as desired and bathed in the broth. Buttered corn on the cob (cut into small lengths) sprinkled with salt and crushed black peppercorns, is another great side (but not meant for dipping in the sauce). If desired, also present individual side-servings of an aioli mayonnaise** as a dipping sauce for the lobster and shrimp. * Use only the bottom white part of the lemongrass. ** To make ½ cup of aioli mayonnaise, whisk together ½ cup (125 mL) of mayonnaise and 1 tsp (5 mL) of finely chopped fresh garlic. 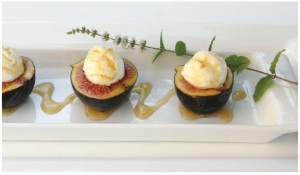 I have designed a goat cheese and fresh fig recipe for those who are not normally tempted by desserts and would rather opt for a piece of cheese or fruit. The culinary finesse of the final plate lies in the drizzle of Anise-Infused Lemon Syrup, which pairs exquisitely with the fresh figs and the soft, unripened goat cheese. 1. Wipe figs clean with a soft cloth. Cut them vertically in half through stem to base. 3. Add 1½ tsp (8 mL) of goat cheese to the indentation of each half-fig. Note: The figs may be prepared to this point hours in advance of serving. Place them in an airtight plastic container and refrigerate until shortly before serving. 4. To serve, arrange artistically on a platter or individual plates (3 half-figs per serving). Drizzle each fig half with about 2/3 tsp (3.5mL) of Anise-Infused Lemon Syrup. 5. Garnish with sprigs of fresh lavender. Margaret Dickenson is a cookbook author, TV host, menu/recipe developer and a protocol, business and etiquette instructor. Margaret Dickenson wrote the awardwinning cookbook, Margaret’s Table — Easy Cooking & Inspiring Entertaining (www.margaretstable.ca). © 2019 Diplomat Magazine. All rights reserved. Designed and maintained by Massive - Ottawa.